The Holy Ascension of Our Lord Cathedral, as it stands today, was built in 1896 and restored in 1996. The interior is from the original chapel with the exception of the lower level of the bell tower, which had to be replaced. 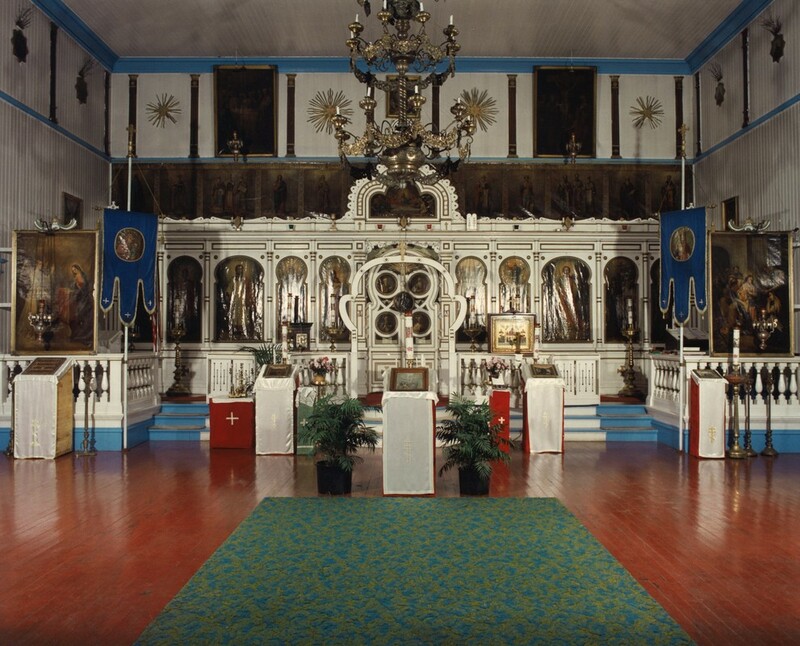 The current cathedral is the 4th church built for the Unalaska parish. The chapel on the left was originally dedicated to St Innocent of Irkutsk. It has the iconostas from the 1825 chapel that Fr. John Veniaminov built, except for the royal doors, which were from the 1808 chapel. Within this chapel we have a copy of the Aleut Gospel of Matthew translated by Fr. John in 1828 and a hand cross believed to be brought here by Fr. John dated 1800. Also in this chapel are several icons that are believed to have been written by an Aleut iconographer, Ivan Krukov, who studied under Fr. John. One of these icons believed to be his work, an icon of St. Andrew, has mountains, volcanoes and terrain similar to the Aleutian Chain in the background. When the Cathedral was rededicated in 1996, this chapel was dedicated to St. Innocent of Irkutsk and St. Innocent of Alaska (the former Fr John Veniaminov, the first resident priest of the parish). The church is currently in the 2nd phase of restoration, working on restoration of the icons. To date, 14 icons have been restored. One or two are sent at a time for restoration which takes anywhere from 6 to 9 months to restore by professional Iconographers. The reason why most of the icons became dark is that during World War II the local residents were evacuated and taken to internment camps in southeast Alaska. These residents took the icons and the articles from the cathedral with them. While in the camp they were put in storage. However, they realized that due to the cold and moisture the icons were beginning to mold. Thinking that cooking oil and 3-in-1 oil would stop the mold, they applied this on the icons, resulting in the icons becoming dark. In the late 1940s they tried putting shellac on the icons to brighten them but compounded the problem. The services are still sung and chanted in the Aleut language, Slavonic, and in English. Everyone stands during the services. The women still stand on the left side and the men stand on the right. There are some benches against the back wall for the elderly to sit. Interior view, courtesy of the Museum of the Aleutians, photo donated by Steven Minor.